Darkspace have been wandering the cosmos for the last two decades. 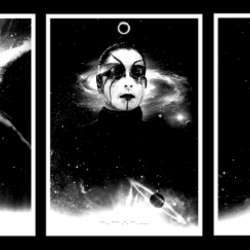 Their albums and interstellar concept have been fundamental to the development of modern black metal: many atmospheric black metal bands, industrial black metal acts, cosmic black metal projects and even those flirting with ambient have been influenced by Zorgh, Wroth and Zhaaral. With only four albums in a twenty-year span, more than half of which spent under the banner of Avantgarde Music, their releases are regarded as landmarks in the genre. Despite their paramount relevance, Darkspace have always been refractory to media exposure: interviews are very rare and live shows even more so. That is why this announcement is great news: to celebrate their twentieth anniversary, the atmospheric black metal trio decided to land back on our planet and tour across Europe.